MIRACLE HEALING ATTRACTS 80 FAMILIES TO KNOW MORE ABOUT JESUS ! 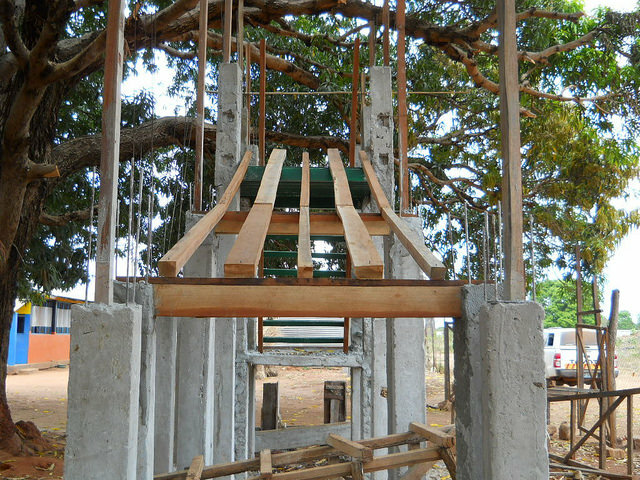 Much fruit is pour­ing forth from the 2 churches in Namuno Dis­trict, 24 miles (40 km) south of Balama, spon­sored by Hine­ston Taber­na­cle of Hine­ston, LA. Pas­tor Alberto, our Evangelist/Teacher and his Pas­toral Trainee, Valen­tine, have been vis­it­ing the 7 local vil­lages for the last 2 months. They planted the Word of God, watered it faith­fully, and now their work is bear­ing fruit, as 2 of the 7 vil­lages are now build­ing a shade area where they can meet each week. Both churches have about 40 fam­i­lies and at least 60 chil­dren in each church. Pas­tor Alberto called me on Thurs­day to tell me that a men­tally ill woman in a vil­lage called “25th of June”, (famous hol­i­day in Moz. ), came to her right mind after he prayed for her this week! This woman was known by every­one in that vil­lage as the “crazy woman”! When peo­ple wit­nessed this heal­ing mir­a­cle, 80 FAMILIES in the vil­lage came to the church to find out more about this Jesus who heals! Jesus came to seek and save the lost. 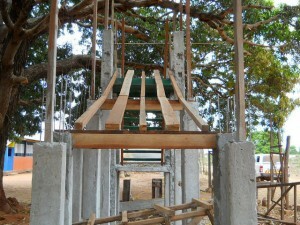 His Holy Spirit is mov­ing with great force through our rural areas, and it is a beau­ti­ful site to see. Moringa is one of God’s plants with many won­der­ful ben­e­fits. It stim­u­lates breast milk in lac­tat­ing moth­ers as well as lac­tat­ing goats, it’s a pow­er­ful live­stock feed that keeps goats healthy, and best of all, any­one who eats it daily gains a stronger immune sys­tem. I was noti­fied by an Aid orga­ni­za­tion who spe­cial­izes in Moringa, that we should plant imme­di­ately, since a strong immune sys­tem will be needed to help us get through any “strange dis­eases” that might come our way. We already have 800 trees on our prop­erty, as they make great fence posts, but decided to plant at least 400 more, so that we’d have plenty on hand for all our orphans, wid­ows, and staff. The leaves regen­er­ate con­stantly, and the more you pull off, the faster the tree makes fresh ones! 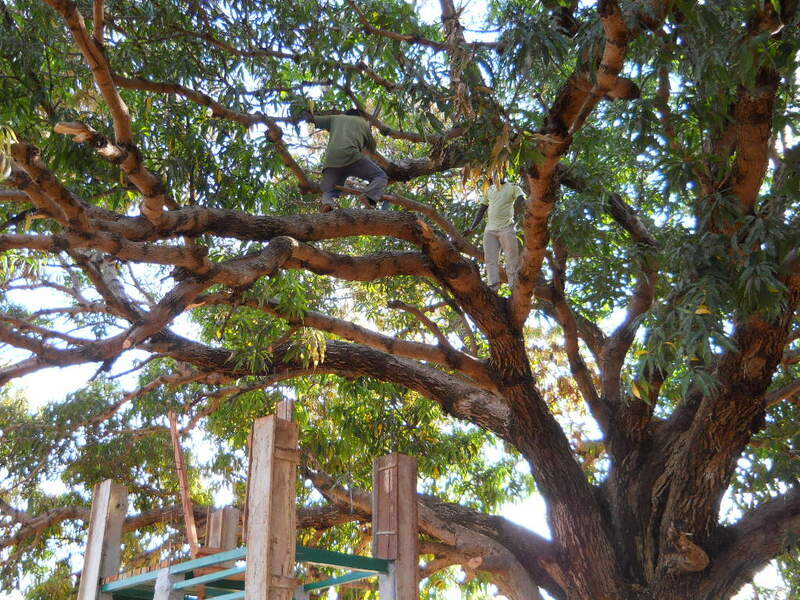 Sept to Nov. is Moringa plant­ing time for tree limb cut­tings. Just cut off a branch with a 2 inch (5 cm) or greater diam­e­ter, and stick it in dry ground about 1 ft. (30cm) deep. The field looks a bit silly until they start to sprout, cause it looks like a field full of odd look­ing fence posts. Many of our Pas­tors have donated their cut­tings, and this week, we cut over 200 limbs off exist­ing trees on our prop­erty. Katie, Ash­lynn, and I are using it in almost all our dishes, and the very young leaves are deli­cious in salad as well. 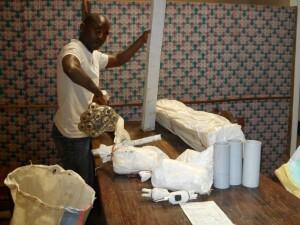 I’ve also started teach­ing many vil­lagers and our staff about Moringa and all its ben­e­fits. Many were shocked to learn it was good for so many things, and said they planned to get their wives to start putting it in their food. 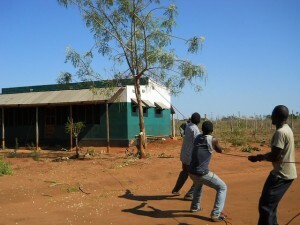 Most of these men have Moringa grow­ing in their yards, as many use it as liv­ing fence posts. God made Moringa to ben­e­fit all of us in Africa, and we THANK HIM FOR IT! Noth­ing like a year round gar­den that grows strong dur­ing the dry season! 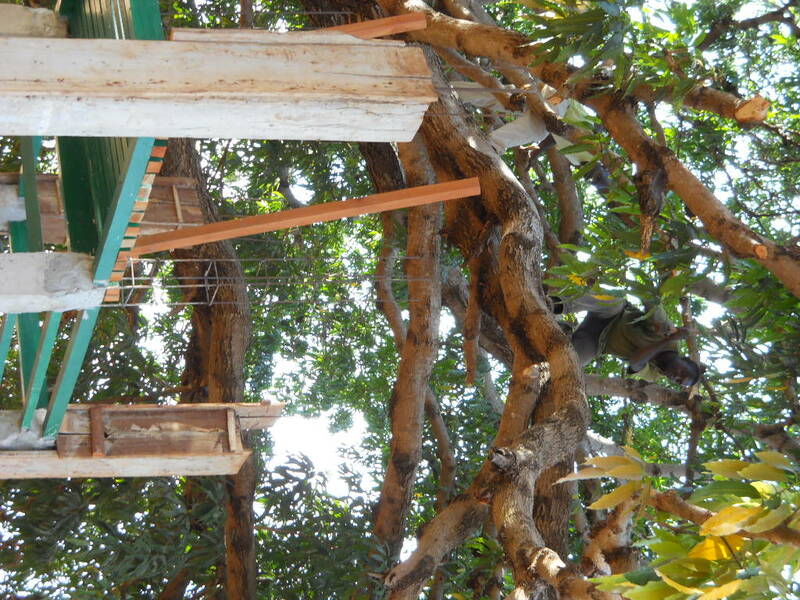 The 2nd story of the Super Play­house reaches into the tree branches of the huge Mango Tree that shades it. 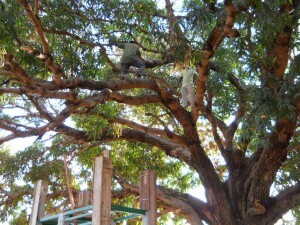 We needed to cut off a few branches in order to make room for the small roof that will pro­tect the chil­dren and the super slide from falling mango fruit from Octo­ber to Decem­ber each year. Green mango fruit is as hard as a base­ball before it ripens. A “goose egg” size knot on your head is the nor­mal, if you get hit by one that drops off due to a big gust of wind. I was busy tak­ing pho­tos of the men cut­ting the limbs as it was quite a feat for them to chop away at the same branch they were sit­ting on. When it came to the last and largest branch that had to be removed, the 5 men on the ground ask me for a rope so they would have bet­ter con­trol as the branch fell. 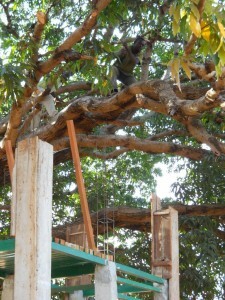 We’d already had a smaller branch dam­age one of the 4X4’s on the play­house, and wanted to avoid any fur­ther damage. I was well out of the way, or so I thought. This huge branch snapped off pre­ma­turely with a loud CRACK! My heart jumped for it was not falling as expected, and was headed straight for ME! Argentino is cut­ting one of two limbs. His right foot is on the limb that tried to take out The Bunny. All I remem­ber is piv­ot­ing to jump out of the way, and 2 sec­onds later found myself lay­ing in the dirt with 5 guys grab­bing my arms and drag­ging me to my feet. THE HUGE TREE BRANCH was lay­ing just inches beyond my feet! I landed so softly in the dirt that I was with­out pain, scratches, or bruises, which is not pos­si­ble with­out super­nat­ural inter­ven­tion. I have no rec­ol­lec­tion of how I got where I did, because it was over 12 feet from where I’d been stand­ing. There were NO foot­prints in the dirt between the spot I piv­oted and the spot I landed. The men said I just flew through the air with this huge branch actu­ally piv­ot­ing on it’s point so that it FOLLOWED ME! My crew were totally ter­ri­fied, as it looked like I would surely be crushed by the limb. After I was on my feet, one of the men had to sit down before he fainted! He said he couldn’t believe I was OK.
After a few laughs, they cut that huge limb into pieces, and removed it from the playground. It was too heavy for even 5 men to lift it. I’m very, very grate­ful to be alive, and I thank Jesus, the Holy Spirit, and God’s Angels for “lift­ing me” out of harm’s way. In mid-August, I was noti­fied by the offi­cials in Meluco County that 15 of their wells needed repairs. The list of parts needed to repair them was staggering! 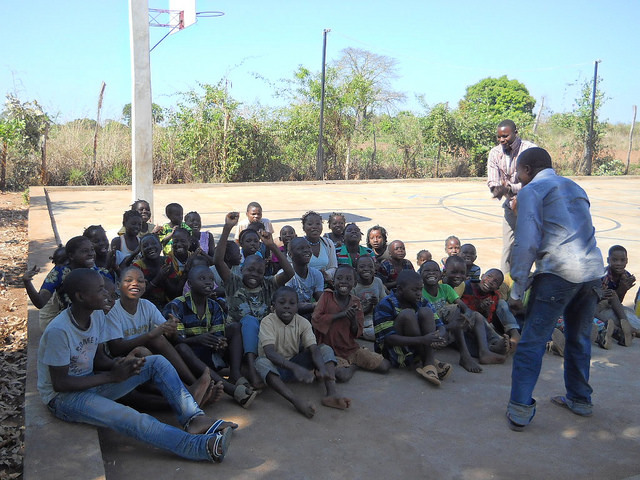 Thanks to a gen­er­ous gift by Wayne K. of But­ler, PA, lit­er­ally 1000’s of peo­ple will have access to clean water by next week. Manuel and Mario, our 2 man “water well fix-it team” will leave early Mon­day morn­ing, spend­ing 3 days repair­ing water wells in the super dry Meluco Dis­trict where 515 of our orphans live. A few of these wells are ones we drilled, but most have been around for years, and their main parts are totally worn out. 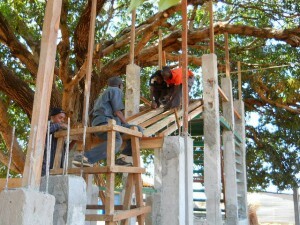 Each year, over $3,000 is needed in repair parts to main­tain these hand pump Afridec wells. Thanks to the drilling com­pany who sells us the parts, we can stretch this gift even fur­ther this year, as they gave us a dis­count because we bought in bulk. Manuel and I orga­nized and repacked this table full of water well parts last Thursday. Life can­not exist with­out clean water. Repair­ing exist­ing wells is the fastest way to bring LIFE and HEALTH back to a vil­lage in need. ASHLYNN GOT HER RESIDENCY! PTL! Paper­work was filed and REJECTED on Thurs­day, “bum­mer”, because unknown to us, the word­ing had been changed for the request let­ter since we filed Katie’s paper­work last month. Thanks to coop­er­a­tion in Balama, the cor­rect doc­u­ment was orga­nized late that same after­noon, so they could return to Pemba on Fri­day to file the newly worded paperwork. Katie and Ash­lynn are hav­ing fun prepar­ing new clothes for the orphans in our care. 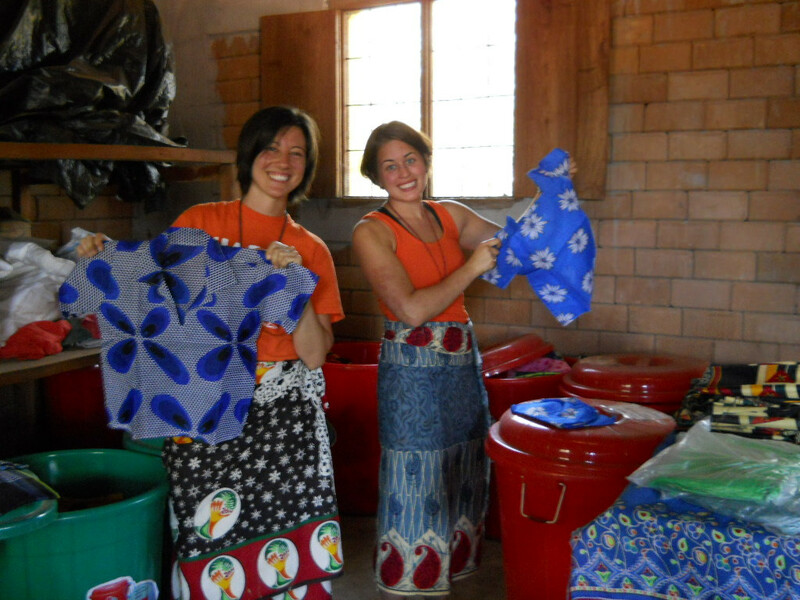 As I write this, Katie and Ash­lynn are hard at work fill­ing plas­tic sacks with the right size cloth­ing for the orphans in each vil­lage. While Manuel goes to Meluco early Mon­day, Capena’s team will hand out food in 3 loca­tions between Mon­day and Tues­day. Each of those 340 orphans will receive a new set of clothes made at our sewing cen­ter here at our mis­sion station. On Mon­day, BBB will keep the “home fire” burn­ing. Mon­day is corn milling and rice hulling day. Some­body has to stay behind and get it done. Beats bounc­ing on rough roads for sure! So even before the sun comes up, our teams will hit the road! Keep your prayers cov­er­ing us, for we have lots of food to move in the next few months. Zito, now 13 years old, has been in a wheel­chair for 5 years after a soc­cer acci­dent crip­pled him with a frac­tured femur at 8 years of age. It was not set well since no doc­tors existed in this Dis­trict at that time, caus­ing it to heal very crooked. He was unable to straighten his left leg. When we met Zito 4 years ago, he was severely ane­mic, suf­fer­ing from staph boils, and extremely mal­nour­ished. It has been a long road to this point, as his body didn’t seem to want to cor­rect the ane­mia even with vit­a­mins, a high pro­tein diet, and Hypo (super high pro­tein instant cereal packed with many vit­a­mins for mal­nour­ished chil­dren). PERSISTENCE is the name of the game with Zito! We prayed for his heal­ing but noth­ing hap­pened, until I got a visit from his Pas­tor yes­ter­day. Pas­tor Ramadan raced to my house after church on his motor­bike to tell me that ZITO had WALKED the length of the church in front of every­one! It was too late to go out to his home yes­ter­day after­noon, as it is 8 miles into the bush, so the Balama Blaz­ers and I went out today to see for ourselves. Pas­tor Ramadan inter­preted Zito’s story of what made the sud­den change in his legs. Zito stated that he woke up one morn­ing last week and just “KNEW” that he could walk. 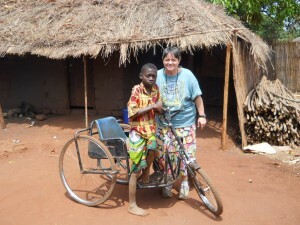 He told no one, not even his mother, and after she left to go fetch water, he tried his legs AND THEY WORKED! He couldn’t man­age to take more than a few steps at first, but said that after a few days, he could walk from their house to their cook­ing room (about 25 feet/8 meters). On Sat­ur­day he told his mother, who didn’t believe him! She demanded to see it for her­self. ZITO WALKED for her and then for the entire church yes­ter­day (Sept. 7th). Today when we arrived, he was more than eager to show us that he is get­ting stronger and able to walk a good dis­tance. His left knee remains bent from con­stric­tures, as that is the way his leg healed, but he is walk­ing on it with­out pain! He also states that the pain he use to have in his good leg has also gone away. 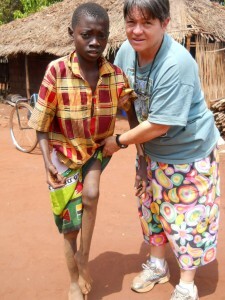 He never walked on the crutches we gave him because weight bear­ing on his good leg was too painful. It’s not a per­fect healing–YET! But watch­ing him walk tells me that there is more to come as he exer­cises, for I can see that his bent left knee looks to be straight­en­ing out more and more with each step. His entire body is stronger than I’ve seen it in the entire 4 years I’ve known him, and his ane­mia is almost gone. For the first time, I saw a true smile in his face, as I told him how proud I am of him. He rarely smiles, but that lit­tle grin told me our boy Zito is on the mend! 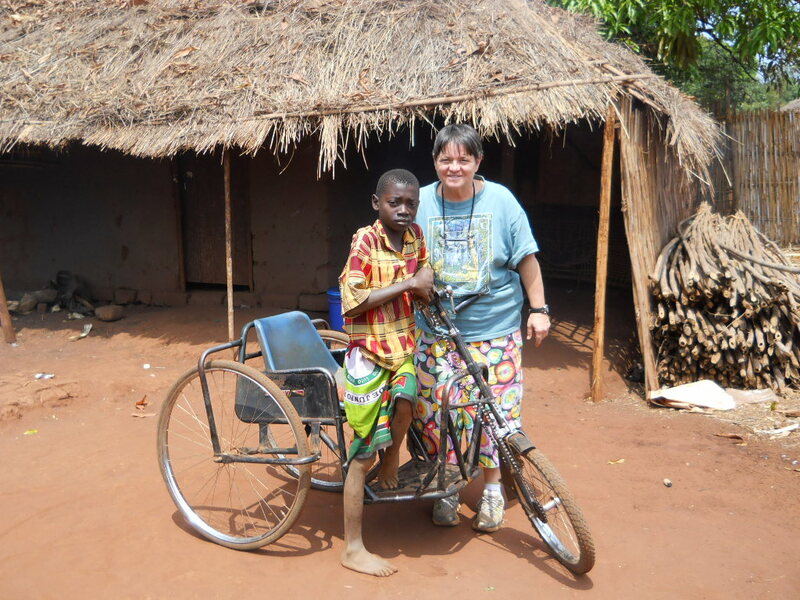 Jesus gave Zito the “go ahead” and now that lit­tle boy is mov­ing out with every ounce of strength he has.